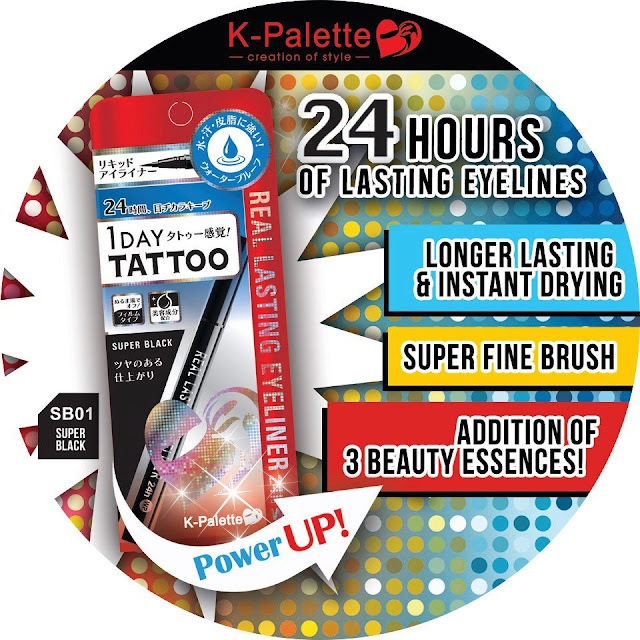 Something New: K-Palette Real Lasting Eyeliner --- POWER UP! December of 2011, I blogged about K-Palette's 24H Real Lasting Eyeliner Waterproof HERE (wow, I didn't realize it has been more than a year ago!) and I still swear by this liquid liner until this day! (Read my Readers' Corner post on Must Try Liquid Liners). This liner is approved by yours truly that I even highly recommend these to clients! Recently, I saw their newest ad, K-Palette 24 Hours Real Lasting Eyeliners with addition of 3 beauty essences aside from the usual long lasting, instant drying and super fine brush that won my heart! I'm glad to try these 2 out (one in black and one in brown)! To be honest, I don't need to ask for anything more for the old 1 Day Tattoo liner but 3 additional beauty essences is definitely a huge plus! Want to know more? If you love the old version and plan to repurchase, do not forget to look up the POWER UP! sign on the upper left hand side of the packaging! K-Palette 24H Real Lasting Eyeliner Waterproof is exclusively available in Beauty Bar stores and retails for Php895.00 (approx $20.80). LIKE them on Facebook to get updated on new products! Have you tried K-Palette's Real Lasting Eyeliner? If no, will you save up and give this a try? Up until this very moment, I bid goodbye to gel liners for quite some time as I prefer to use this due to convenience and the effect is as good as gel liners!